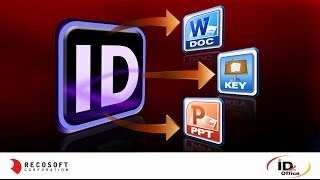 Convert InDesign files to Word type using ID2Office 2019. ID2Office 2019 is a plug-in for Adobe InDesign CC to CC 2019 and allows anyone to convert an InDesign file to Microsoft Word type. 3. When the ID2Office - Options window appears, set the file type to convert to Word and click Export/Save. You now have a Word file created from InDesign. Adobe released InDesign CC 2019 about a month ago, and we want to use this time to show ID2Office 2019, the latest release of our Adobe InDesign to Microsoft Word, PowerPoint and Apple Keynote conversion plug-in which adds support for InDesign CC 2019. 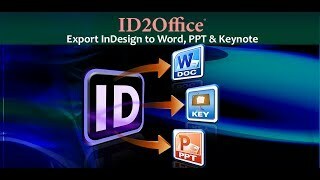 ID2Office is a tool that provides seamless conversions of InDesign CC files to Microsoft Word, PowerPoint and Apple Keynote types. With just a few clicks you get to export InDesign files to Word and the other Office formats. Here on the screen you see that I have InDesign CC 2019 running; and I want to share this InDesign file with my colleagues that use Microsoft Word. ID2Office starts to convert the InDesign file to the Word (docx) type. After the conversion is over, I have a Word file from InDesign, that I can share with my colleagues who use Microsoft Word. Let’s open the Word file to make sure everything is okay and everything looks pretty good! So, that was fairly easy. I don’t need to recreate the contents of InDesign files in Word anymore. 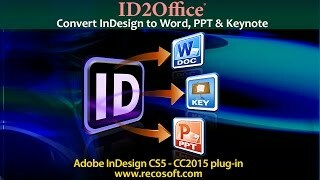 But I can also convert the InDesign file to PowerPoint or Keynote type using ID2Office; again, which helps in sharing my InDesign file contents with the company staff that use Microsoft PowerPoint or Apple Keynote. ID2Office 2019 from Recosoft supports InDesign CC through CC 2019 and converts InDesign files to Word, PowerPoint and Keynote formats.